Get some electrons (heat a metal). Make them run as a beam (flow, current): Near the heated metal place an anode/positively charged electrode – place these under the influence of an electric field ; connect a high voltage power source across anode and cathode. Have the electrons fall onto a phosphor screen : each electron will leave a mark. How do you make a circle appear with successive marks? Approach a magnet to the beam; it will deflect it (charged particles behave like magnets). Move the magnet so that you change the course of the electrons before they fall on the screen. This is the principle of the classic TV/computer screen. The impression given by oscilloscopes and medical device screens (e.g. heart rate monitoring) comes closer to the idea. Let us take a step back in time. We are at a time before the discovery of the electron and scientists observe that the heated metal, the cathode of the electric circuit, gives off some kind of rays. These are called “Cathode rays”. 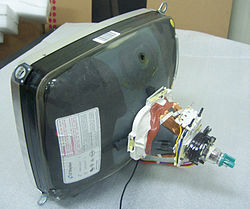 If you enclose the whole thing described above including the phosphor screen in a tube, then you have a “Cathode Ray Tube” (CRT) that was used in classic TVs and screens in general. Anode means “ascent” and represents the fact that you have to make an effort to reach it. Electrons will easily “walk down” from the anode to the cathode electrode. 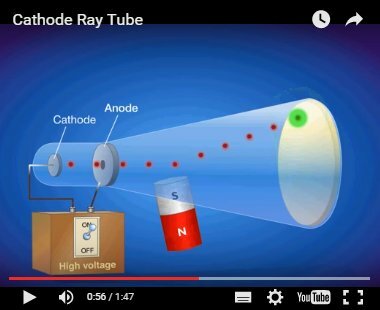 It was Thomson who discovered that the rays consisted of negatively charged particles which he named electrons. Why “electron”? What is the etymology of the word? The word “electron” comes from the greek word for “amber”, the word ἤλεκτρον/ΗΛΕΚΤΡΟΝ. In ancient greek eta was pronounced as a long vowel [ɛː] (εεε) (Linguist Prof. Babiniotis) and therefore in latin it is written as “electron”. (In modern greek it is pronounced as [i] like the vowel of "is"). 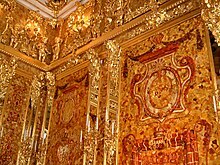 Amber as mentioned in wikipedia is fossilized tree resin and it “can acquire an electric charge by contact and separation (or friction) with a material like wool”. This property, first recorded by Thales of Miletus, suggested the word "electricity" (…). 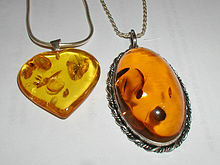 Amber pendants made of modified amber.